some of the dolerite boulders at the upper Kupgal rock art site appear to have been used for percussion purposes. These boulders, which were referred to as ‘musical stones’ bear multiple small groove-like impressions. these impressions emit loud musical ringing tones when struck by granite stones. The production of these deep bell- or gong-like sounds occurs only when the rounded impressions are struck, and not when other parts of the boulders are hit. Similar rounded impressions or ‘ringing rocks’ as such stones are commonly termed in other parts of the world, were subsequently found at other rock art sites in the vicinity, including the dolerite outcrop to the west of Halakundi. This shows the musical sense in the early kannada people. The boulders which have small, groove-like impressions are called "musical stones" by locals. When struck with small granite rocks, these impressions emit deep, "gong-like notes". This gives the earliest evidence of musical sense of Kannadigas. The site is situated in the Bellary district of mid-eastern Karnataka, approximately 5 km north-east of the town of Bellary. Archaeological sites in this area appear in the literature under different names, but the names of Sanganakallu and Kupgal, two local villages, occur commonly. Here, neolithic remains are found concentrated on the tops and slopes of an outcrop of granitic hills while remains of the megalithic (Iron Age) and Early Historic, and subsequent periods are found predominantly in surrounding plains. 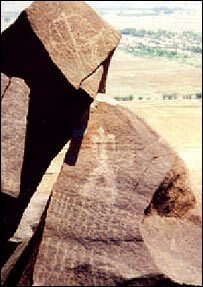 The art work besides showing plants , Bow and arrow also show a man gripping woman by Hair.Of the many sites here, the largest is located on the biggest and northernmost of the granitic hills. It was called Peacock Hill by the British during the colonial period and is referred in early kannada literature. Local Kannadigas, generally call the hill Hiregudda, which simply means ‘Big Hill’ in the local Kannada language. Most archaeological literature, however, refers to the hill as Kupgal hill, after a neighbouring village (though it must be noted that the nearest village is Sirivaram). Kupgal hill is a fairly large granitic hill with several peaks, with a large dolerite trap dyke running along its axis. Petroglyphs belonging to different periods, from the neolithic to the modern day, can be found bruised or engraved on the black rocks all along the dyke. A heavy concentration of rock art is seen where the dyke emerges across the upper northern peak of the hill. The site was first reported in the Asiatic Quarterly Review in 1892 (Fawcett). The report included a brief summary by Fawcett along with hand sketches by Sewell. It is also mentioned by Foote in his 1916 volume on the Prehistoric and Protohistoric Antiquities of India. But subsequent explorers who tried to trace it were unable to do so. Brief descriptions of the site by Subbarao (Subbarao, 1947), Gordon (1951) and Padayya (1973) appeared, but the site itself remained lost. A few pictures of the site had also been taken in the 19th Century, but the originals were either lost, or allowed to fade. Photographs apparently taken by Fawcett had been sent to the Madras Museum and the Royal Anthropological Institute. While the ones in the Madras Museum were lost or allowed to fade, those in the R.A.I. were re-photographed before they faded. These were later published by Gordon (1951). 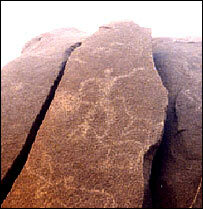 In 2002, Dr. Boivin in association with Ravi Korisettar of the Karnataka University carried out a study of the site and published photographs which effectively make it the only the second time that photographs of the Kupgal petroglyphs have been published. Although later in date than the proto-Harappan neolithic of the early Fifth to third millennium BC, the Karnataka neolithic (which actually overlaps with the Mature phase of the Harappan Civilisation), is of special interest to researchers. This is because, unlike the neolithic of Baluchistan and eastern Afghanistan (which share similarities with the neolithic of neighbouring South-west Asia), the Karnataka neolithic features a distinctively Local crop package, a distinctively Local emphasis on cattle pastoralism and a distinctively Karnataka form of ritual involving the burning of large quantities of cowdung widespread in Karnataka known as Buddhi betta (Ash Mound). This latter ritual in particular, is a unique feature of the Karnatak neolithic and has resulted in the formation of large ‘ashmounds’ up to 30 feet high at various places.